Somewhere along the line relationships turned sour, decisions got escalated, and one of the groups/stakeholders won a contentious argument about the design of the product. A common complaint about social networks is that they insulate us by only showing us information we’re already likely to agree with. This solidifies our existing confirmation biases and makes us less likely to see the value of other viewpoints. It’s a legitimate concern, but we only have ourselves to blame. The problem is that if we don’t follow enough people from different types of networks, we’re always going to see the same type of information over and over. And in this fundamental point also lies the best way to get the biggest benefit from social media. So stick with me as we discuss some sociology theory, which I promise will lead to some practical implications in the end. First, a little background on Structural Hole Theory. 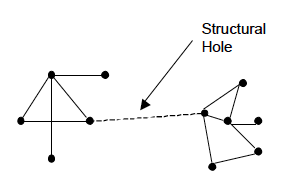 Ronald Burt’s theory of “structural holes’ is an important extension of social network theory, which argues that networks provide two types of benefits: information benefits and control benefits. Information benefits refer to who knows about relevant information and how fast they find out about it. Actors with strong networks will generally know more about relevant subjects, and they will also know about it faster. According to Burt (1992), “players with a network optimally structured to provide these benefits enjoy higher rates of return to their investments, because such players know about, and have a hand in, more rewarding opportunities”. Control benefits refer to the advantages of being an important player in a well-connected network. In a large network, central players have more bargaining power than other players, which also means that they can, to a large extent, control many of the information flows within the network. People with a lot of followers on social media have a high degree of Control benefits — they are often extremely influential in their fields, and in unique positions to have control over certain conversations on the web. But being an influencer doesn’t guarantee that you will have strong Information benefits , because you tend to get the same news over and over again if you don’t do a bit of work on expanding your network in a very deliberate way. Burt’s theory of structural holes aims to enhance both these benefits to their full potential. A structural hole is “a separation between non-redundant contacts” (Burt, 1992). The holes between non-redundant contacts provide opportunities that can enhance both the control benefits and the information benefits of networks. The figure below shows a graphical representation of this definition. The concept of non-redundant contacts is extremely important, and refers to contacts who give you access to networks you aren’t already part of. Now let’s look at how Mr. Scoble can increase the Information benefits he gets from Twitter. The size of the network. The size of a network determines the amount of information that is shared within the network. A person has a much better chance to receive timely, relevant information in a big network than in a small one. The size of the network is, however, not dependant merely on the number of actors in the network, but the number of non-redundant actors. In other words, it’s not just about how many people you follow on Twitter, it’s also who you follow. Pretty straight-forward, but let’s continue. Efficient networks. Efficiency in a network is concerned with maximizing the number of non-redundant contacts in a network in order to maximize the number of structural holes per actor in the network. It is possible to eliminate redundant contacts by linking only with a primary actor in each redundant cluster. This saves time and effort that would normally have been spent on maintaining redundant contacts. What this basically means is that if you follow people who all follow each other, your network isn’t very efficient and you need to get rid of some people. Effective networks. Effectiveness in a network is concerned with “distinguishing primary from secondary contacts in order to focus resources on preserving primary contacts” (Burt, 1992:21). Building an effective network means building relationships with actors that lead to the maximum number of other secondary actors, while still being non-redundant. This means that if 10 people give you access to the same network of information, only follow the most important one — their voice will be clearer and not drowned out by the others. Weak ties. In his 1973 paper entitled “The strength of weak ties”, Mark Granovetter (Granovetter, 1973) developed his theory of weak ties. The theory states that because a person with strong ties in a network more or less knows what the other people in the network know (e.g. in close friendships or a board of directors), the effective spread of information relies on the weak ties between people in separate networks. “Weak ties are essential to the flow of information that integrates otherwise disconnected social clusters into a broader society” (Burt, 1992). This basically means that to get more out of Twitter, you need to figure out where your network is weak, and then follow those people who give you access to additional clusters. Building and maintaining weak ties over large structural holes enhances information benefits and creates even more efficient and effective networks. More contacts are included in the network, which implies that you have access to a larger volume of information. Non-redundant contacts ensure that this vast amount of information is diverse and independent. Linking with the primary actor in a cluster implies a connection with the central player in that cluster. This ensures that you will be one of the first people to be informed when new information becomes available. If we apply these theories to Twitter and other social media networks, we quickly realize it is not the sheer number of “friends” in your network that count, it is the diversity of the people in your network that is most important. If you only have links to people in your immediate group of friends or colleagues, it will be difficult to get new information, since everyone will pretty much know the same things. This is not to say that you have to start following all those random spammers on Twitter, but it does mean that people with who you have “weak ties” will often provide you with new information and therefore more benefits than your “strong ties”. Identify the information networks you want to have access to (for me, it’s information about user experience design and product management). Go through your following list and see where the overlap is — if there is a lot of resharing going on of the same people, follow the person who gets reshared the most. This will reduce your Twitter stream but still get you the information you need (and faster than before). Once you’ve reduced your following list, make your network as large as possible with the “weak ties” who will give you access to all the information you need. These theories show that we can reduce the number of people we follow while actually getting more Information benefits from social media. We will get new information faster, we will get it only once or twice, and the information we get will be more diverse. Burt, Ronald S. (1992). Structural Holes: The Social Structure of Competition. Cambridge: Harvard University Press. Granovetter, M. S. (1973). “The Strength of Weak Ties.” American Journal of Sociology 78: 1360-1380. It is well known that Twitter skews heavily towards younger tech-savvy users, with the rest of the population finding it hard to see the point. Facebook, on the other hand, is increasingly being used by an older demographic. The fastest growing demographic on Facebook is women over 55. I recently attended a brand presentation where the video below was shown. It’s pretty funny, and also a perfect example of how interactive products and consumer-generated content should fundamentally change our traditional views of customer loyalty. Loyalty in our current environment is fostered through repeated great (user) experiences, not just through advertising and coupons. But even though I like the general point the video is trying to make, I think it stops a little short of the real issue. It is saying that we should listen to our customers better. But that’s not enough — we need to understand customers in ways they don’t even understand themselves, and then build experiences that meet unmet (and sometimes unconscious) needs through repeated, positive experiences that deepen the customer-company relationship. Uncovering these needs happens not just through “Voice of the Customer” research programs, but also through more contextual research efforts like ethnography and contextual inquiries (combined with validating quantitative research). I believe this is where traditional Market Research programs like NPS (Net Promoter Score) only tell a part of the full brand loyalty story (albeit an important part, for sure). There is evidence that the tide is turning on this topic as the field of HCI (Human-Computer Interaction) becomes more mainstream and user experience research techniques become more accessible. There is a powerful synergy in discovering how to deepen true customer loyalty through collaborative efforts between Market Research and User Experience Research, and we need to bring these two disciplines closer together (this view is also very much in line with the thinking described in the excellent Adaptive Path essay The Long Wow). The definition and measurement of clutter. There are a variety of ways to measure clutter on pages, ranging from the completely objective (e.g., % of white space on a page) to completely subjective (e.g., how do users rate the page on a clean vs. cluttered scale). The definition of conversion. Since some pages on an e-commerce web site are revenue-generating, and others aren’t, an important question is how you define conversion. For revenue-generating pages (e.g., pages with a “checkout now” button) this is easy — “Did the page result in a sale?” For other pages, like product information pages, this measure won’t work, so some other measure of engagement with the page becomes necessary. Controlling for other influencing factors. In conjunction with the first two points comes the problem of causality vs. correlation. Assuming you have your definitions of clutter and conversion nailed down, how can you be sure any changes you see in conversion is caused by clutter (causal relationship), and not some other factor you are not accounting for (there’s correlation but no causal relationship). Twitter users who casually update their status without thinking about it too much continuously say things like “Yep,” “Good night tweeple,” and “Banging my head against the desk.” Cryptic information that can be quite difficult to figure out. I’m not saying that this is necessarily a bad thing. It’s just clear that some people view Twitter as a broadcast medium mainly meant for people they know in the real world, and that’s fine (I tend to think that’s what Facebook is for, but let’s not split hairs about this). I’m also not suggesting that all tweets should be serious — the odd random or exasperated update can be interesting, enlightening, and often very funny, and it also shows that there’s a real person at the other end. I do follow a lot of these casual users, but I know all of them personally so their updates are meaningful to me. And of course there is always the option to stop following someone, so you only have yourself to blame for the content you receive on Twitter. A recent discussion on a user experience forum I participate in turned to the topic of A/B testing. I really enjoyed the conversation so I wanted to reiterate some of the points I made, and expand on it a little bit as well. It’s not my goal to define A/B testing here but to share my opinion on its use. I believe that even though A/B testing can be extremely valuable to help identify the best iteration of a site or a particular page, it should never be used in isolation. Since A/B testing is relatively cheap to do and the results are so compelling, companies are in danger of adopting a “test and learn” culture where pages are just A/B tested with no additional user input. That would be the wrong way to go. A/B testing shouldn’t be used on its own to make decisions, it should always be used in conjunction with other research methods — both qualitative (such as usability testing, ethnography) and quantitative (such as desirability studies).